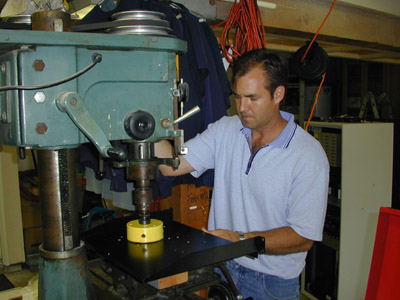 This is Marshall (KE6PCV) me, drilling a 4 inch hole in a rack tray. This 4 inch hole will be where the cooling fan is mounted for the link transmitter. 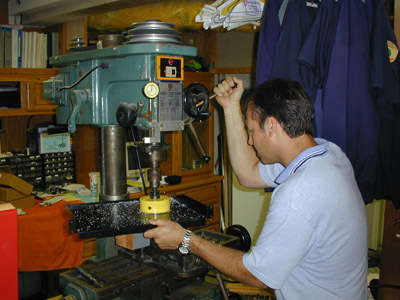 Another shot of the special 4 inch drill bit that we use to make holes in metal for the cooling fans. This drill bit is a very expensive tool! But it sure makes the holes come out nice and even in the metal. It nice to have the right tools! 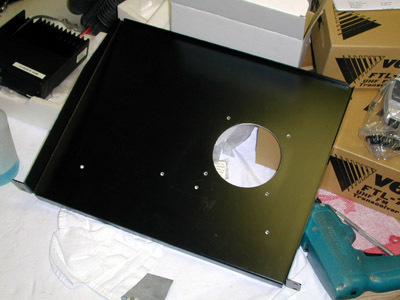 Here is what the rack tray looks like when we get done drilling the necessary holes for the fan and link radio brackets. 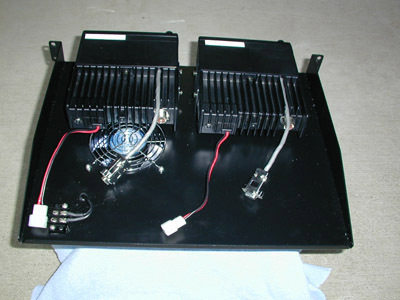 A front view of the finished link radio tray. Bob (WB6DIJ) bought these radios for the Otay project. 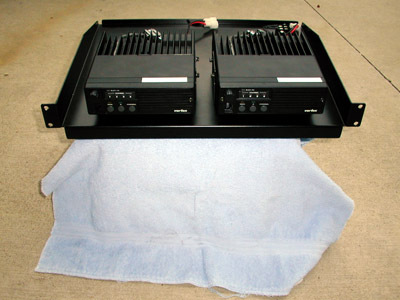 Bob also modified these radios and installed DB9 connectors onto the back of each radio. Thanks Bob! This is a back view if the link radio tray. This tray mounts right into the repeater rack. One radio for receive and one radio for transmit. This allows Calnet to run full duplex on our links. 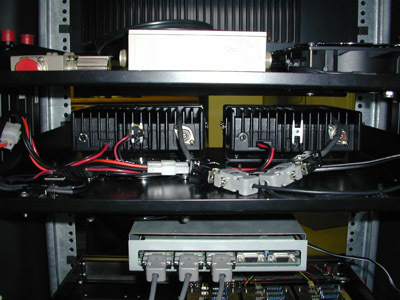 Notice the DB9 connectors that Bob (WB6DIJ) installed on the radios. These connectors allow us to access discriminator audio, PTT and transmit audio from inside the radio. 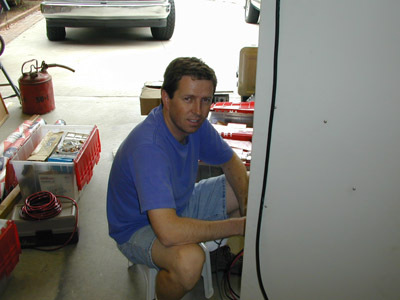 Gerry (KB6OOC), came of to the house and helped out by building the DB9 cables that go from the controller to the UAB box. He also built the DB9 cables that go from the Mitrek head plugs to the back of the UAB box. I think that he built a total of 9 cables. He started at 4:00 pm and he did not finish until 10:00 pm. Lots of labor involved! Gerry (KB6OOC) plugging in one of the custom DB9 cables that he made into the controller. Each cable was cut to the right length then built. 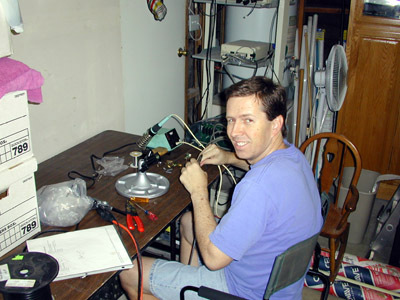 Another shot of Gerry as he is working on the cabling for the UAB box and the Controller. 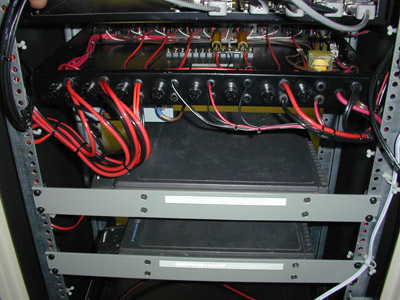 This is a view of the back of the rack looking down on the DC power switch box built by Cliff (KA6JRG). 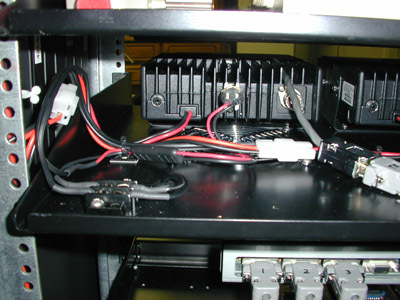 Below the power box are the Mitrek radios that are mounted on rack panels. Finally a view of the rack at 10:30 pm. We spent a lot of time today working on the project and got a great deal of work accomplished. The rack is starting to look like a real Calnet repeater! 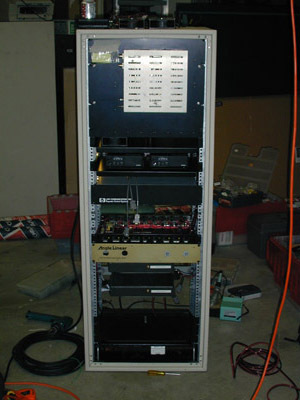 This is a view of the back of the repeater rack. You can see all the new DB9 connectors that go from the UAB box and control system. Wires running every where! 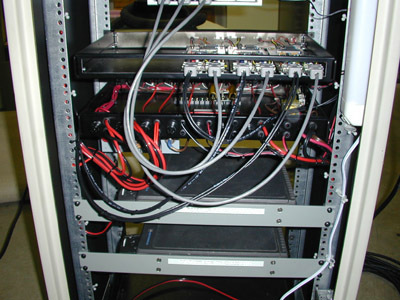 Notice that the DC wiring is completed and all wires are running into the DC switch box. This box really makes things easy for us. All power in the rack is controlled right here. 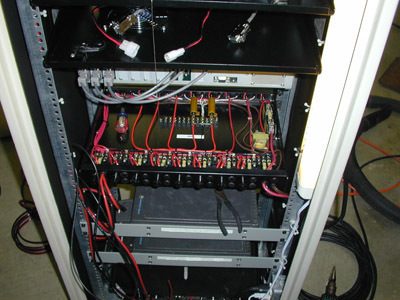 This is a back view of the link radio tray installed in the repeater rack. Notice the power connections and audio connections. We also put a RLC-4 in the rack temporarily while Cliff (KA6JRG), streamlines the audio in the new RLC3 radio port cards and control system. Close up of the transmit link radio heat sink. Notice the thermostatic switch that is mounted to the heat sink. This thermostat will switch on and turn on the fans once the heat sink reaches 100 degrees. 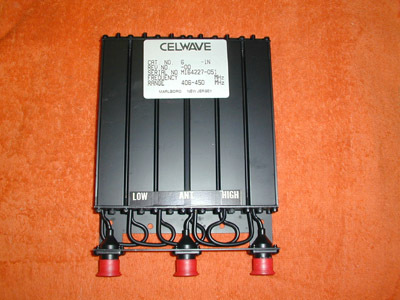 Here is a photo of one of the link duplexers. 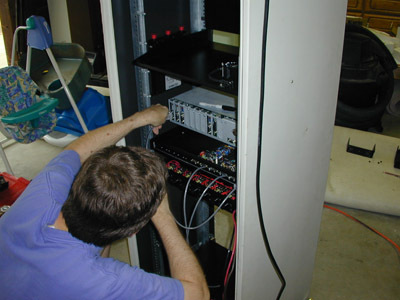 Gerry (KB6OOC), tunes these duplexers on a very expensive HP Network Analyzer to get the very best performance possible. 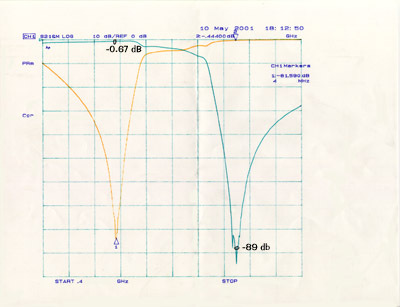 Here is a graphical plot of the performance of the duplexer on the left hand side of the page. Notice that the insertion loss on the receiver is -0.67 dB and the notch on the transmitter is at -89 dB down on the receiver port of the duplexer.